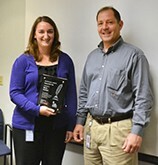 Indium Corporation's Maria Durham, product specialist for semiconductor and advanced assembly materials, has been named the company's latest Silver Quill Award winner. Durham's paper, Semiconductor Fluxes for Wafer Bumping in 3D Assembly, was presented at the IMAPS Conference on Device Packaging. The paper explores the spin-coating process for bump fusion fluxes, which is an important processing technique, used in the electronics assembly industry. This approach uses centrifugal force to produce a uniform thickness of fluid material on a rotation surface to coat silicon wafers. Indium Corporation's Silver Quill Award encourages individuals to author technical reports, presentations, articles, and books. It then honors the most effective works based on their relevance and impact on the industry. The paper may be downloaded at www.indium.us/E039. Durham serves as a technical liaison between Indium Corporation's customers and internal departments, such as sales, technical support, research and development, and operations to guarantee the best quality and selection of products. She earned her bachelor's degree in physics and applied mathematics from Clarkson University in Potsdam, N.Y.